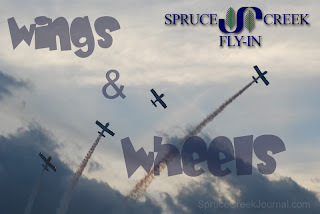 SPRUCE CREEK, FL - Spruce Creek's most awaited event of the year, The ever popular Wings & Wheels Flying and Static Displays show will be held this Saturday March 28th. A large turnout of residents and friends and family are expected to meet at the famous "Tree" located in Windsock Park at the Spruce Creek Fly-in Community. This year's attendance is expected to be a historical record. At the last Wings and Wheels, several thousand people were regaled with a fabulous display of formation flying along with static displays of aircraft, cars and motorcycles. This year's event will include performances by the Spruce Creek Gaggle Flight and the Mavericks flight teams. In addition there will be a large static display of aircraft, many from WWII vintage, as well as collector cars and motorcycles. 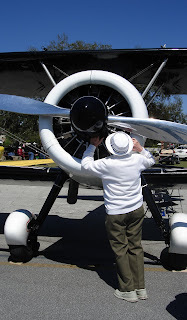 The all-volunteer event is planned and organized by the residents of the Spruce Creek Fly-In Community in Port Orange, Florida. Funding for the activities is provided by the residents of Spruce Creek and donations from local businesses. Other activities held throughout the year include the Annual Easter Egg Hunt, Family Movie Night, Summer Bash, Breakfast with Santa as well as many other events organized in conjunction with the famous Spruce Creek festivals: The Annual Bonfire, and the Toy Parade. Saturday March 28th 10:00 am to 2:00 pm and beyond.